You are here: Home / Baby / Let’s Talk: Vegan Prenatal Vitamins! Let’s Talk: Vegan Prenatal Vitamins! 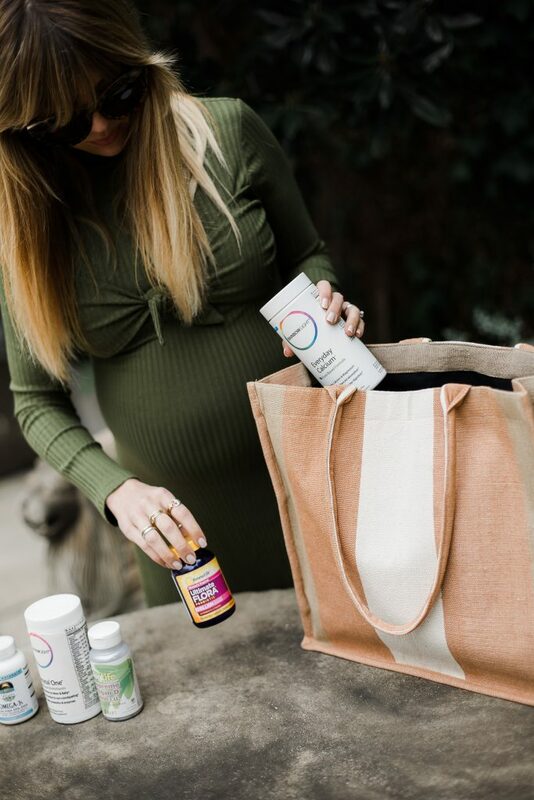 Since announcing our pregnancy, I’ve gotten more questions than ever before asking me about supplements (read my previous post on regular, everyday supplements I’ve taken and recommend here), as well as vegan prenatal vitamins. To be honest, a vegan pregnancy has not been any different, to my knowledge, than a non-vegan pregnancy. At 30 weeks, I’ve gained 19 lbs, which is totally on track. My OB was completely unfazed by my strict vegan diet and lifestyle (if you’re in Dallas, I highly recommend Dr. Amy Martin), even when I was a BIT low in vitamin D (Americans in general tend to be low in D, but vegans and vegetarians can be slightly more susceptible to low values). She and her team helped find me vegan prenatals so that baby River and I can go on to have the healthiest pregnancy possible. Ready? Let’s go! 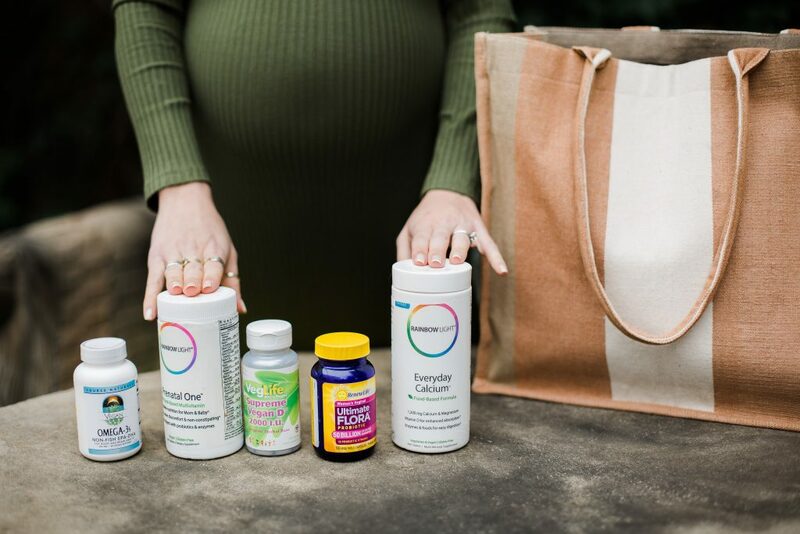 Every day since the beginning of my pregnancy, I have taken 3 supplements: a) Rainbow Light’s “Prenatal One,” b) Source Naturals’ “Vegan Omega-3s Non-Fish EPA-DHA,” and c)Renew Life’s Ultimate Flora Probiotic. I’ll discuss each briefly below. I want to note that I had very minimal morning sickness compared to most of my friends– and I am honestly not sure whether that had anything to do with the prenatal I used. I do know that some brands are more easy on the tummy than others. Anyway, my vegan prenatal has the folic acid and other nutrients you need for your developing baby and has worked perfectly for me without upsetting my stomach. My Omega-3 DHA supplement is to help with River’s brain development. It is somewhat difficult to find a non-fishy source of EPA and DHA, and this supplement seems far superior to trying to get your values via flaxseed oil. The Flora Probiotic is really helpful all the way through your pregnancy, because your hormonal changes will make you much more vulnerable to vaginal and yeast infections– which are not only annoying and uncomfortable for you, but can potentially pose a threat to your baby– and this will definitely help offset these issues and bring balance to your nether regions. Most of the ones I looked at were not 100% vegan, so I was happy to find this one. Near the middle of my pregnancy, I was told that my vitamin D was lower than recommended. So, at my nurse’s urging, I began taking 2000 I.U. of vegan vitamin D with my lunch. This will help make sure that River is growing strong, healthy bones, and also supports mama maintaining a healthy blood pressure. Some studies show that it helps prevent gestational diabetes as well. So I take these just about every single day, and have since week 20. Once I hit the third trimester (home stretch!!!) I began integrating a vegan calcium supplement into my daily routine. Your baby’s skeleton is rapidly developing at this point in your pregnancy, and you need a bunch of extra calcium. “The fetal skeleton gets what it needs, no matter what, even if it has to leech essentials from its mother’s bones,” says Murray Favus, MD, director of the bone program and professor of medicine at the University of Chicago. Needless to say, when I read that quote I knew I didn’t want my bones being leeched, so I started researching exactly how much calcium you need in the third trimester vs. how much your prenatal offers, if any + the calcium that is already in your daily diet. I decided I wanted about 1,200 mg of calcium daily. It turned out I needed a lot of calcium, even though I do eat vegan sources such as nuts, beans/lentils, and tofu; so I got Rainbow Light’s Everyday Calcium (vegan tablets) and have been taking them with dinner every night. So, that’s it, folks! 5 supplements total, every day now that I’m at the end of my pregnancy. My labs have been perfect ever since starting the vitamin D, and I feel good (well, I feel tired. Haha. But generally, I feel healthy and like I’m building a pretty big, strong baby). Please let me know if you have any questions at all about vegan pregnancy, prenatals, or anything else for that matter! I’m here to help! Ethically-made dress (not maternity, but it works perfectly with the bump! ): From eco/ethical boutique Rêve En Vert… But I just looked and this particular dress is sold out. However, I did find it ON SALE for 30% off here. Organic, cotton tote bag made by displaced women artisans: On major, major sale, at ethical fashion boutique Love Justly. My go-to, every-day-of-my-life-sunglasses: I swear these are said to be sold out everywhere BUT I found them here for you, and on sale!! « My Dogs’ Homemade, Vegan, “Special Food” Recipe!